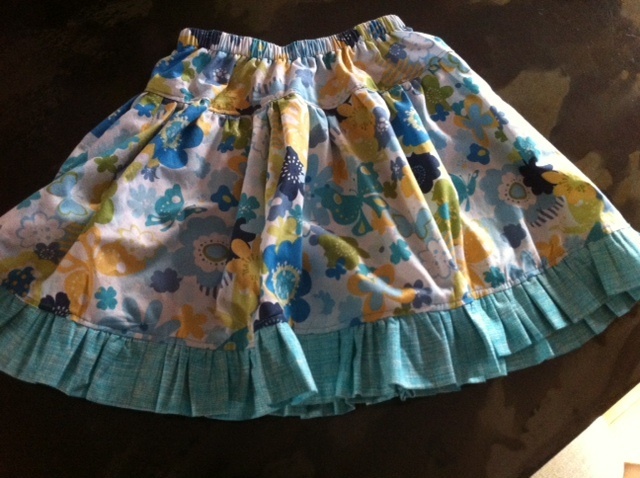 The Restitcherator: Izzy N Ivy Addie Jo Pattern Review - Adorable Skirt pattern! Izzy N Ivy Addie Jo Pattern Review - Adorable Skirt pattern! I got this pattern as part of a kit from Above All Fabric. I love Melanie's kits. She does a great job choosing fabric choices and makes it easy to get the package in the mail and start sewing right away. This was the first Izzy N Ivy pattern I've made. I always love trying new pattern designers, and this one did not disappoint. The pattern comes with 5 different style choices. My daughter chose version C, which had a ruffle at the bottom of the simple skirt top. This was my absolutely FAVORITE pattern type. The directions were very well written, with clear diagrams inside and it was easy to follow along with which version of the skirt I was making. The directions were fairly short, none of the versions of this skirt were very complicated. I made a modified size 6. My daughter is a skinny Minnie, so we have to really decrease anything with a big waist or too much fabric. This worked out perfectly, between the elastic waistband that I could cut to fit her, and the "just right" amount of fabric for a nice twirly skirt that was not too much to overwhelm her little frame. Also, it came in a ziploc bag, which is wonderful. The cellophane with a sticker I always manage to make a mess of, rip the sticker and the cellophane gets stuck to another pattern. The directions were on nice thick stock, printed in an easy to read font. Perfect. I would absolutely make this skirt again in another one of the versions. It went together very quickly. Including cutting, I would say a total of 2 1/2 hours. The only reason it took me that long is that I am NOT a good gather-er. I always break at least one set of gathering stitches and have to start over. Thankfully, this time, it was only once. Who are your favorite pattern designers? For quilts and for clothing? Your daughter is darling in that skirt! I love Izzy N Ivy patterns. I haven't made any of their clothes yet, but I have made three of their bags, and all three did not disappoint.